A pathbreaking feminist analysis of sound's shifting relation to image in film. 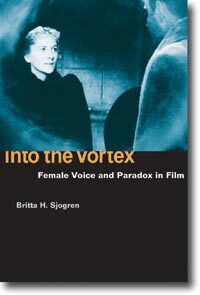 INTO THE VORTEX challenges and rethinks feminist film theory's brilliant but often pessimistic reflections on the workings of sound and voice in film. Including close readings of major film theorists such as Kaja Silverman and Mary Ann Doane, Britta H. Sjogren offers an alternative to image-centered scenarios that dominate feminist film theory's critique of the representation of sexual difference. Sjogren focuses on a rash of 1940s Hollywood films in which the female voice bears a marked formal presence to demonstrate the ways that the feminine is expressed and difference is sustained. She argues that these films capitalize on particular psychoanalytic, narratological and discursive contradictions to bring out and express difference, rather than to contain or close it down. Exploring the vigorous dynamic engendered by contradiction and paradox, Sjogren charts a way out of the pessimistic, monolithic view of patriarchy and cinema's representation of women's voices.